Submissions close next week on Consultation on electoral boundaries and representation, and Grafton is set to be cut right down the middle. Before I try to explain the complexities, please consider coming along to our Grafton Residents Association meeting on Monday 10 September at 7 pm in the small conference room of the Liberal Catholic Church, on the corner of Claremont Street and Carlton Gore Road. It’s pretty much all we’ll talk about. There is an awful lot going on in this proposal, so I’ll try to tell the story as far as Grafton is concerned with pictures, then hit you with links to more information. As the song goes, the first cut is the deepest. 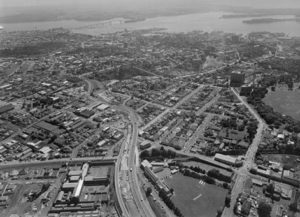 In 1957, the suburb of Grafton was sliced in two by the motorway, creating numerous dead end roads. Some would call it lazy, but I think it was just too easy for the boundary folk to slice the southwest part of Grafton off along the lines of the motorway, with no actual thought about communities of interest or the historical parts of Grafton that exist to the southwest. You can download the full map (or all the boundary maps). You can see that the right half of this red area is the southwest corner of Grafton, which includes the historic Grafton Library, now Galbraith’s. Aside from cutting up a community of interest, the proposal also makes voting in next year’s Local Government election far more confusing for voters and far more expensive for Council, as Mike Lee’s excellent commentary on the changes points out. Please take a moment to read Cr Mike Lee’s commentary. It looks a bit long, but the middle is full of quotes from legislation. Unless your are a law nerd, read the opening and then skip past all the legislation stuff and read the last few paragraphs. In brief, because Auckland’s CBD has such a high percentage of residents who are ineligible to vote, there really isn’t a 10% crisis happening that justifies all this chopping and changing. Cutting off the southwest corner of Grafton does nothing to improve this, as it leaves our resident student population in the Waitematā Local Board area. In fact it makes the situation worse. What we need is for the Auckland super city legislation to be fixed so that we can arrange our representation in a sensible way. That cannot happen in time for 2019, so better to let things remain as they are until the fix can be made. It is my opinion that Auckland’s representation will be severely messed up by the proposed changes, and not just those in Grafton. What is your take on this? I’d love to know, and I’d love to talk about it on Monday, so we can prepare our submission in time. Hi what time is the meeting on Monday 10 September please? The meeting on Monday kicks off at 7pm. I thought it was in the post, but alas it is not! Edited. Seems to me that once again Grafton is the Bridesmaid!! 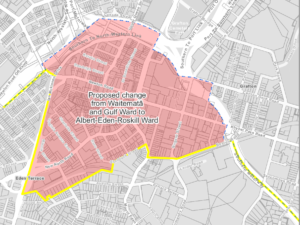 When we first arrived it was in the Orakie/Remuera and Epsom electorates then Waitemata after more lobbying by David Haigh to keep us out of the then proposed Eden/Albert ward. From memory it was that we would be on the outer fringes and largely ignored (have been by all others anyway!) so the best option was Waitemata. I couldn’t care less about Eden Albert and I’m damn certain they won’t be caring about us “on the other side of the motorway”!!! The portion proposed to be sliced off is, in my opinion, a small price to pay compared to the whole being swallowed up! !